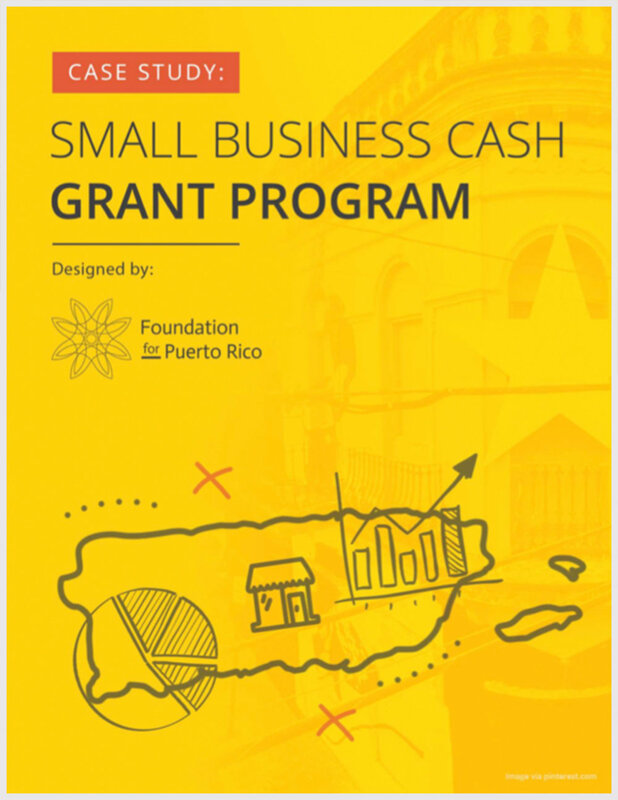 Due to the significant impact of Hurricane Maria and the lack of existing programs for small businesses after the storm, Foundation for Puerto Rico (FPR) quickly designed, developed, and deployed what came to be known as the Small Business Cash Grant Program (SBCGP).The SBCGP supports existing business owners to remain open, retain employees and optimize their business through immediate business assistance and relief. Likewise, this project seeks to promote the local economy in areas with a high impact on the Island tourism. To implement and strengthen this initiative, FPR joined forces with Centro para Emprendedores (CPE) and the Puerto Rico TechnoEconomic Corridor (PRTECH) to support and provide different types of assistance during the interventions. Eligible businesses within a selected commercial district would receive half of the cash grant amount upon completing a thorough needs assessment and then receive the second installment three weeks later upon demonstrating progress with program requirements. Technical support accompanied the cash grant to assist business owners with recovery planning. The second installment was only given to business owners that completed four hours of coaching, and that maintained the business open. The first phase of this grant program started with an $89,000 fund to revive vital commercial neighborhoods in Santurce, Aguadilla, and Ponce. Given the success of the first phase and the ongoing need for technical assistance, FPR expanded the program to more communities and sectors in Puerto Rico, reaching 200 small businesses in 13 commercial districts across the island. Presents the results of more than 850 hours of individual technical assistance and more than $500k distributed in cash grants to 200 small business owners in 13 commercial districts across Puerto Rico. According to the Federal Emergency Management Agency (FEMA), 40% of small businesses close after an emergency, but only 7% of the participants in the Small Business Cash Grant Program closed. Outlines the design, implementation and program evaluation phases to provide insights, lessons learned and policy recommendations. Local stakeholders from the business development ecosystem expressing the program’s value. Introduces a new model of business support that focuses on financing; technical assistance; improve resiliency; and sustainability.